EU Prize for Literature winner (2013), Faruk Šehić, was born in 1970 in Bihac. Until the war broke out in 1992, Šehić studied Veterinary Medicine in Zagreb. However, the then 22-year-old voluntarily joined the army of Bosnia and Herzegovina, in which he led a unit of 130 men as a lieutenant. Literary critics regard him as one of the most gifted young writers in the former Yugoslavia, as a shining light of the so-called 'knocked-over generation'. His books have been translated into English, German, Bulgarian, French and Macedonian. 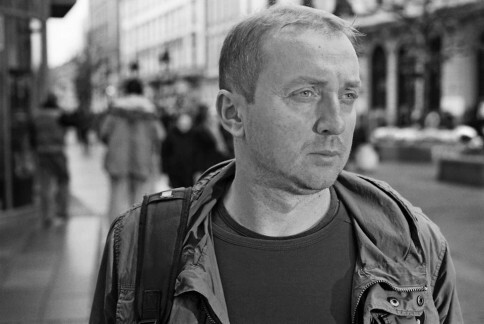 His debut novel „Knjiga o Uni“ (Quiet Flows The Una) was awarded the Meša Selimović prize for the best novel published in Serbia, Bosnia and Herzegovina, Montenegro and Croatia in 2011, and the European Union Prize for Literature 2013. He works for the magazine BH Dani as a columnist and journalist. If it rains on the eve of Friday, the rain will fall for seven days, Grandmother Emina always used to tell us. And rain covered our sky with the force of the ayahs from the sura Al-Qari’ah (The Calamity). I dreamed that the water surrounded us on all sides, and my Grandmother’s house set out on its first voyage. Before we became Una-farers there was a mighty crash as the house tore loose from its earthly roots. Thus relieved of its foundations containing remnants of bomb casings and stabilizers from the Second World War, detached from the stones of the former house that burned down when the Allies bombed the town, and freed from the fluvial tufa at its base, the house prepared for the worst: a journey into the unknown. The fleet-footed ones who weren’t caught unawares by the water, like we were, climbed up to Ravnik on the very top of Hum Hill, where they hoped the sun would finally break through the clouds and stop the deluge. Those of us who had little choice and didn’t want the freak weather to decide things for us took fate into our own hands. Miraculously, the cellar retracted into the house and became our machine room with red pressure gauges and small, round wheels for steering in those precarious floodwaters. The valves of the gauges flipped up from time to time to let off angry steam whenever the engines ran hot. The grapevine uncoiled from my Grandmother’s house and became a sail of leaves, in case other forms of propulsion failed. We tore through the deck with the help of a crowbar and I took up the metal steering wheels. My Grandmother stood at the kitchen window together with Uncle Šeta, who had served in the Yugoslav navy. The house had become a vessel and the kitchen was now the bridge, with my Grandmother as captain, holding her string of prayer beads. The amber beads circled in their silent universe. Šeta held a harpoon at the ready in case he spotted a giant pike. Water sprayed in our faces and surged towards the kitchen, but that didn’t diminish our mariners’ resolve. We floated on down the Unadžik straight towards Pilanica, and all the way to the confluences, whose sandy beds always harboured barbels and sneeps. Here the Unadžik flowed into the Krušnica and the two waters came together. The Krušnica stayed close to the right-hand bank, so the water was colder, while the Una took in the left-hand side of the fraternal stream. When the river was low during the summer, shaggy bullrushes would float in the middle of the current, and their flowers looked like the eyes of timid, pygmean hydro-beings. I tried casting a brass spoon lure made for use in turbid water through the cellar window, while closely monitoring the manometers with their red needles and following the course given by my grandmother. Skilfully, we steered clear of the thick, opaque layers of tufa that the water flowed over. ‘Hard left!’ my Grandmother yelled, and I would take the rudder and turn it until the house responded to the desired manoeuvre. Fish in sea, river, lake, boiled hectic. The river-side houses in Pazardžik had long disappeared from view and we passed down through the crests of the Pilanica cascades into the newly formed lake, which stretched all the way to the school and threatened to inundate the first houses on the grassy slopes at the rear of Hum Hill. Although it was the time of the year for floods, no one had seen one of this magnitude, at least not in my Grandmother’s lifetime. Now we began to glide down the arm of the Una and the main current of the Krušnica, whose combined force submerged the long islands and everything on them for miles around. The crossbars at FC Meteor’s stadium and the football pitch of its lower-division brother, FC Željezničar, jutted out of the lake showing just a foot or two of post. Mute, dirty water besieged the stadium’s western grandstand. The bloated carcass of a cow hung in a goal net. Three hours from where we’d started, the water was trying to reduce Točile Hill by climbing higher than the crowns of the powerless trees. Birds’ nests were swallowed up everywhere. Fish never seen in the daylight emerged from the depths, with ungainly bodies and heads so much like people’s that some of them could talk. One with tin scales called out to me in astonishment, gazing past my Grandmother’s house at the clouds drifting above Točile: ‘The first angel sounded his trumpet, and there came hail and fire mixed with blood....’ Quick to interrupt it, I replied through the porthole of my machine cabin: ‘and it was hurled down upon the earth. A third of the earth was burned up, a third of the trees burned up and all the green grass.’ Upon which the fish withdrew into the silty depths, slapping the water’s surface with its heavy tail. The look in its eyes was terrible—older than time. I thought I caught a glimpse of the Monster from the Juice Warehouse riding in a giant freshwater mussel and carefully noting everything that happened. Weariness was taking hold and it was impossible to ward off dismal thoughts. At that point the dream was cut as if by the blade of a Solingen knife and I woke up breathless in my Grandmother’s guest room under the massive quilt. The beating of the clock’s mechanism on the wall above me lent a Gothic note to the sleeping darkness. The house was still on dry land and the Unadžik back in its suit, which had not become too narrow for it. The water was content and travelled tirelessly on towards the confluences to mix with the Krušnica’s cold flood. I resolved to get up and go down to the cellar to check the red needles of the two metal water gauges, whose position and number showed the water consumption of my Grandmother’s house. I got out of bed at dawn and went into the corridor. Water was trickling down the coat-rack mirror on the left near the front door and the carpet in the corridor was soaking wet. The thick coats of white paint on the walls had cracked in places as if the house had been hit by an earthquake. Now I realized that my grandmother’s house moved about secretly at night, nudged through the water with the furtive aid of aquatic protozoa and their cilia; its nightly progress could be expressed in centimetres, for the time being. Cilia are the tiny flagella of certain water-borne organisms, a substitute for legs. The house wanted to move to another, more stable neighbourhood, far from the wild river in my dreams and out of reach of floods and other disasters, to somewhere it could live to a ripe old age. It should be a town with better inhabitants — Peter Pan, Hansel and Gretel. But the house was naive, just like those whose hands built it. In the spring of 1992, the house thought it would be spared because it had never caused anyone any harm. All the other houses around it were blazing yellow torches on children’s drawings. It made believe that there was such a glare all around because the stars had come out early in the sky. It pretended the other houses were not fiery suns that collapsed back upon their inner infernos. Its mind withdrew to the very highest point of the attic, where it cowered and shuddered like a freezing owl. But all that the house had at its disposal were the cilia and the river, whose murmur would conceal its escape. Time flowed inexorably, and it wasn’t on the house’s side. The house prepared to betray its destiny, which has been repeated with horrifying precision every fifty years — that it be reduced to ash. Needless to say, its flight never succeeds.